As a parent, you can track your child's activity within Teamie with much more ease with the help of Teamie mobile apps. When you log into Teamie, you'll land on the parent home page. On this page, you will see the parent dashboard with the details of your children who are mapped with your account. No other content of your child’s account will be shown here. 1. 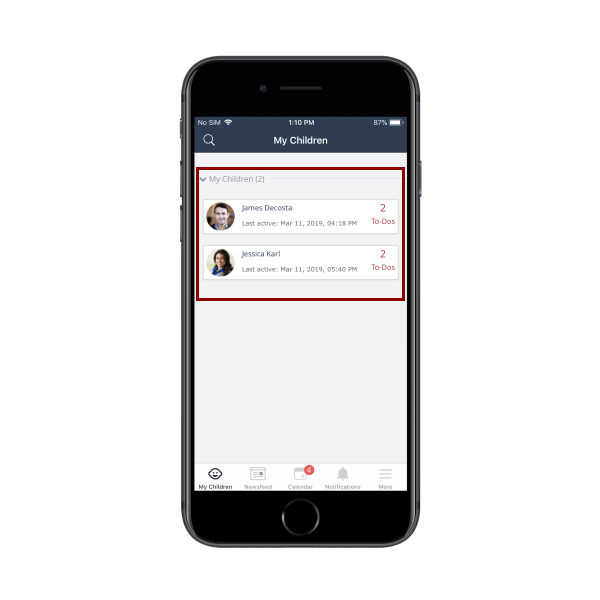 As soon as you log into Teamie, you will see a list of your children on the home screen. The Last Active info displays the date and time at which your child was last active on the site. Count of upcoming To-Dos (task and assessments) that your child has to do. In case you are proud parents of more than one child and have enrolled them on Teamie, then you will be able to view all your children’s activities on the home screen in the form of cards and can access them by tapping on their name. 3. Tapping on a child's card will take you to their Overview screen where you can see quick stats of your child's activities. 6. The Scores & Grades: area shows the list of all the graded classrooms. 7. The Classroom Participation: Displays a list of all of the classrooms (active and archived) that your children have accessed or participated till date, and the total Teamie points they have earned in those classrooms. 8. In Scores & Grades section, tap on a classroom’s name to see its gradebook along with the scores & grade that your child has obtained in that classroom. Parent can only see Scores & Grade of their child’s classroom once the final marks are published by the instructors. Your child’s Recent activities shows a list of activities performed by him/her on different resources (like posts, lessons and assessments) within a classroom, in a chronological order. 2. On the Recent activities page, you will see the log of activities your child has done on daily basis on different resources (like posts, lessons and assessments) in a classroom.